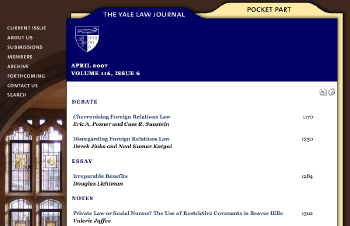 The Yale Law Journal is one of the most highly regarded academic publications in the field of law. Each year the Journal's Editors receive thousands of submissions for publication which they have to narrow down to a few dozen articles to publish. Base 16 developed a new Submission Management System from scratch to replace their existing, outdated system, and made a portal for the Journal's Members to manage the business affairs of the Journal. Base 16 integrated the new Submission Management System with the Journal's web site and assisted with the hosting and database issues as well as the transition from the legacy system.